I'm not a woman, but I do consider myself a feminist. That word means different things to different people, so let me be clear -- I take the word to mean that I support the rights and equality of women. Whether "feminist" sounds too old-fashioned or too militant, I give the word no more or less meaning. I'm a feminist for two reasons. The first is easy and really not about me. I just honestly do believe in the rights and equality of women. The second is perhaps less easy and totally about me. As a gay man, I believe that much of what continues to keep gay men down is that we are still, in the eyes of many, equated with women, or at least being like women. I find nothing wrong with being compared to women. Quite frankly, I hope women run the world someday (I know, many would say they already do). Perhaps with women in widespread roles of power, the world would find itself in a better place. However, for now, being a woman or a girl, in too many places, still means being subservient to a man. As long as women are not considered equal to men and gay men are considered to be like women, then both of us, women and gay men, will continue to be thought of as less than. I don't want that fate for either of us, but I certainly don't want that for myself. Not only is advocating for women the right thing to do on its own, but it's also in the interest of all gay men. When it comes to health care, especially sexual health, both women and men have a shared interest. Planned Parenthood fulfills that need for women -- and men. That men are welcome isn't as well known as the organization would like. Also not as well known is that Planned Parenthood provides vital HIV services. Nancy Duncan, a Planned Parenthood peer educator who lives with HIV, knows all about the HIV services her employer provides. Efforts to defund the group not only hurt women, but also the fight against the virus. Nancy graces our cover, representing the intersections between HIV, sexual health care and politics. Click here for more. Sherri Lewis, a former POZ cover gal from 2008, also knows a bit about living with HIV. Although she remains HIV positive, thankfully Sherri was recently cured of hepatitis C. Having lived with both for so long, it's now one down and one to go for the singer and activist. Click here to catch up with Sherri. We also catch up with Bamby Salcedo, a trans woman living with HIV and a fierce activist. Her efforts on behalf of trans women and men, as well as Latinas and Latinos, are well known among her peers. She recently moved into being a full-time activist. Click here to find out what's next for Bamby. 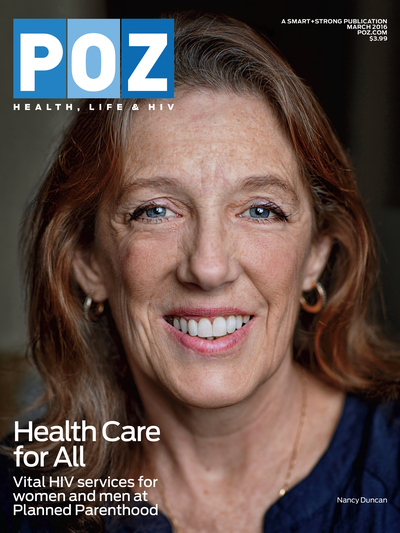 For 25 years, Sharen Duke, the executive director and chief executive officer of AIDS Service Center New York City (ASCNYC), has been a full-time advocate for people living with HIV. Click here to read about the work of ASCNYC.